As a staff surgeon at a large community hospital, I am often in the emergency room at 2 a.m. and hear that the residents are "capped," that is they can't admit any more patients to their service. I work hard all day, and if there are emergencies I work all night. And I may have to work a portion of the next day. Since no one else is available, would it be fair to patient care to tell the ER at 4 a.m. that the acute appendicitis or perforated bowel must wait until the next morning because I am too tired to come in? Unfortunately, that is what is being mandated in medical teaching programs. Experience is what gives us good judgment as physicians. Sitting at a patient's bedside, watching them get better or worse is a powerful teaching tool. If we insist on unyielding caps of residents’ working hours, will we have to extend training programs a year or two longer to provide that experience? There is no question that fatigue affects judgment and performance. However, what better place to learn how to perform under adverse conditions than a properly supervised residency where doctors can learn their limitations? The key is appropriate supervision to guard against compromising patient care. 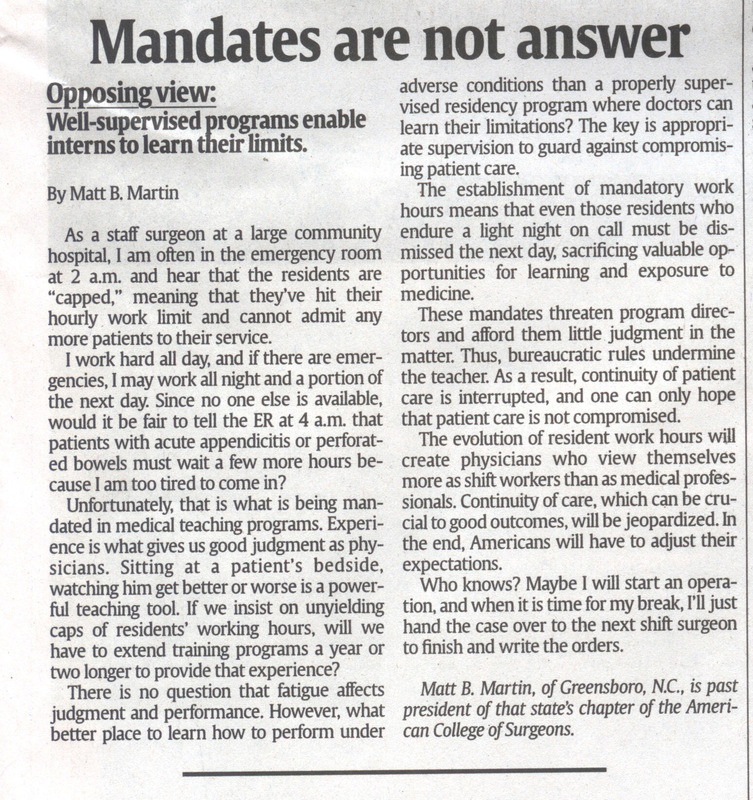 The establishment of mandatory work hours means that even those residents who endure a light night on call must be dismissed the next day, sacrificing valuable opportunities for learning and exposure to medicine. These mandates threaten program directors and afford them little judgment in the matter. Thus, the bureaucratic rules undermine the teacher. As a result, continuity of patient care is interrupted and one can only hope that patient care is not compromised. The evolution of resident work hours will create physicians that view themselves more as shift workers than as medical professionals. Continuity of care which can be crucial to good outcomes will be jeopardized. In the end, Americans will have to adjust their expectations. Who knows? Maybe I will start an operation and when it is time for my break, I'll just hand the case over to the next shift surgeon to finish and write the orders.